The Winner pom and kick teams performed at the Gregory Invitational on Saturday. They earned third place in pom and fourth in kick. Winner Area competitive cheer team took second place at the Gregory Invitational on Saturday. The girls were two points behind Platte/Geddes. “We really could have taken home the top spot except for a small deduction,” said coach Val Ewing. “Overall, for our first competition I was really pleased with how the girls did. We never feel ready for this competition but it feels good to get the first one done and let the girls get the nerves out,” said Ewing. The coach noted the team has a few new girls who have never been in competitive cheer before. Some of them have only done cheer as a club and it is a little different. Ewing added it is good to get feedback from the judges to see what they like or do not like and what the girls need to improve upon. “We have some little things to fix and some stunts that need changed but all in all it was a great competition. Looking forward to a wonderful competition season,” said Ewing. The South Dakota Transportation Commission awarded 26 preliminary engineering bridge improvement grants (BIG) totaling $1 million. Tripp County received two of these grants. One of the grants is over the Keya Paha River near Clearfield in the amount of $41,800 and the other grant is 1.5 miles west and 1.5 miles north of Wewela over the Keyapaha River. The preliminary grant is for $41,800. Fifty-two applications totaling $1.85 million were received by the South Dakota Department of Transportation. Local governments are required to pay a minimum of 20 percent matching fund and have three years to expend the grant. 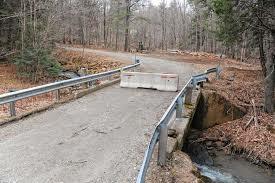 Counties must have a wheel tax and a five year highway and bridge improvement plan in order to receive a grant. The BIG program was created in 2015 by Senate Bill 1. SB 1 set aside $7 million per year from funds generated by license plate fees to be used to repair and replace aging local bridges. The SDDOT adds an additional $2 million annually, making $9 million available. 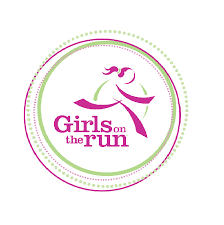 A new program is starting in Winner and is known as Girls on the Run. It is a non-profit program run through EMBE in Sioux Falls and is funded through the United Way. Over a period of 10 weeks, girls in 3rd to 5th grade participate in an after school program. It is designed to allow each girl to recognize her inner strength. Registration is now open. The program will start on Sept. 6 and the girls meet every Monday and Wednesday. They will conclude with a 5k run in Sioux Falls on Nov. 12. Coaches are Lindsey Foster, Emily Tideman, Gail Buus, Monica Metzger, Kallie Farley and Dusti Littau. All have attended trainings and are nationally certified. The local sponsors are Winner Regional Healthcare Center, Jorgensen Land and Cattle, Grossenburg Implement and Casey’s General Store. 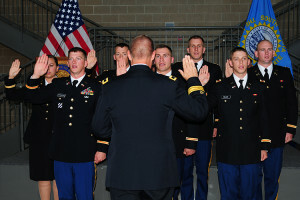 The South Dakota National Guard welcomed seven of the Army’s newest officers to its ranks following a commissioning ceremony at Camp Rapid, Aug. 18. The ceremony marks the end of Officer Candidate School – the first step in officer training and development – and the beginning of their careers as commissioned officers. “Today’s ceremony marks the culmination of three very intense phases of training that has prepared these officer candidates for the next step in their military career, the profession of a commissioned officer,” said Lt. Col. Wyatt Hansen, commander of 1st Battalion, 196th Regiment (Regional Training Institute), the SD Army National Guard battalion responsible for conducting OCS. OCS is taught in a high-stress environment, where candidates are tested academically and physically, both in the classroom and in field environments. Training consists of 16-18 months of drill weekends and two two-week training periods. The commissioning ceremony included several customs and traditions such as the second lieutenants taking the Oath of Office, being pinned with their new rank and receiving their first salute. The evening’s guest speaker was Brig. Gen. Kevin Griese, assistant adjutant general of the SDARNG. The lieutenants will next attend Basic Officer Leader Course, which focuses on their branch-specific training, such as engineering, field artillery and signal. Second Lt. Andreau Miller received the Endeavor Award for demonstrating the highest degree of consistent advancement, perseverance and devotion to duty during the training year. Second Lt. Mitchell DeMers earned the Academic Excellence Award by attaining the highest academic rating for the school year. Second Lt. Ariel Delgado earned the Leadership Excellence Award for attaining the highest leadership evaluations during the training year. Second Lt. Haley Derr earned the Army Physical Fitness Award for scoring the highest on the Army Physical Fitness Test as well as the Erickson Trophy, awarded to the OCS graduate with the highest combined overall standing in leadership evaluations, academics, physical fitness and peer evaluations. The Battalion Leadership Award was presented to SDARNG’s 153rd Engineer Battalion for the greatest number of officers commissioning from Officer Candidate School. 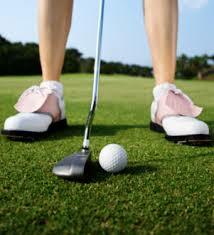 Kari DeMers won first place in the Winner ladies city golf tournament. She shot a 92. Second place in the championship flight went to Jennie Fenenga with a 100. 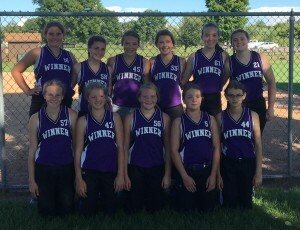 Winner middle school fall softball team was defeated by Garretson Red 7-2 on Sunday in Sioux Falls. The game was tied 2-2 going into the bottom of the fourth inning when Garretson scored five runs to take the lead. Winner defeated Watertown Purple 13-11. Kelbi Meiners had 3 hits driving in a 2 runs. Rylee Root had 3 hits driving in four runs. Libbie Petersek had 2 hits driving in 2 runs. Josey Kludt had 2 hits driving in 1 run. Aleya Miller and Karlee Brozik each had 1 hit. Root, Kludt and Petersek hit doubles. Root struck out 7 batters. 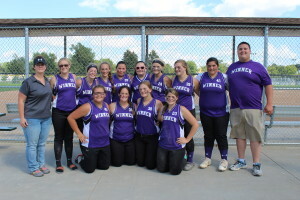 Winner High School fall softball girls split games in their first outing of the season Sunday in Sioux Falls. In the first game, Tri Valley defeated Winner 10-0. Pitchers were Riley McClanahan, Kenndal Turnquist and Elisabeth Duffy. Leading hitters were Jaynee Gregg, Turnquist and Duffy. In the second game, Winner defeated Lennox 8-3. Duffy was the winning pitcher as she pitched all five innings. Leading hitters were Ronae Klein, Mary Calhoon, Alani Old Lodge, Jaynee Gregg, Keyleigh Stands, Joslyn Felix, Riley McClanahan, Alex Bohnet, Delanie Nelson, Hailey Hollenbeck, Kenndal Turnquist, Emmy Kaiser and Elisabeth Duffy. The next game for the team will be Sept. 10 when they travel to Dakota Valley to play the host team. 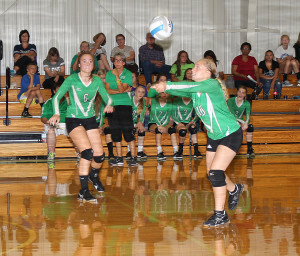 Burke/South Central defeated the Colome volleyball team 3-1 Saturday in Colome. Set scores were 20-25, 25-19, 25-9 and 25-18. Abby Kortan had 4 kills and one ace and Alexa McKenzie had 12 digs. Colome will play in the Gregory tournament on Saturday. Winner Lady Warriors volleyball team opened the season with a victory over Bon Homme last Tuesday in front of the home crowd. The Lady Warriors won in 3 sets 25-12, 25-18, 25-19. Gracie Littau and Sam Marts were 100 percent in serving. Morgan Hammerbeck had 5 ace serves and Abby Marts, 2. Hammerbeck had 17 kills and Abby Marts, 10. Littau had 34 set assists. Alexis Richey was 84 percent in serve receive. Abby Marts and Richey each had 9 digs. As a team, Winner was 93 percent in serving with 12 aces, 39 kills, 37 assists. They were 85 percent in serve receive with 35 digs. “We came out focused and ready to play,” said coach Jaime Keiser. “We were aggressive and did a great job of attacking the ball which kept Bon Homme on the defensive end. We were getting in defensive position and playing very well as a team,” said Keiser. On Thursday, Winner hosted Miller and lost in four sets—25-21, 19-25, 16-25, 20-25. Daesha Klein and Littau were 100 percent in serving. Hammerbeck and Abby Marts had 2 aces with Hammerbeck having 26 kills and Marts, 4. Littau had 41 set assists. Hammerbeck was 84 percent in serve receive and Richey was 83 percent. Richey had 36 digs and Hammerbeck and Abby Marts, 21 each. Sam Marts had 4 solo blocks and 1 block assist and Abby Marts had 1 solo block and 1 block assist. As a team, Winner was 93 percent in serving with 5 aces, 55 kills and 41 assists. The team was 76 percent in serve receive with 112 digs and 7 blocks. Coach Keiser said Miller is great team and brought back a lot of players from last year. “They have a very balanced and athletic team. We came out ready to play and battled back after being down to win set 1. They had some hard hitters and did a good job of playing defense and digging up their hard hits but it kept us out of system,” explained Keiser. The next a action for Winner will in a triangular with Valentine and Ainsworth on Aug. 31. On Sept. 5, Winner will host Bennett County and Gregory.